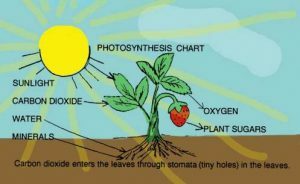 In Blackman’s experiments on the limiting factors of photosynthesis , He concluded that photosynthesis consists of two kinds of reactions which are Light reactions ( light acts as the limiting factor for the rate of photosynthesis ) , Dark reactions or enzymatic reactions ( temperature is the limiting factor for the rate of photosynthesis ) . Light reactions is a group of reactions that occurs in the granum inside the green plastid , as it contains the chlorophyll pigments and the light is the limiting factor for the rate of photosynthesis . Light falls on the chlorophyll of grana inside the chloroplast , some electrons in the atoms of chlorophyll will gain energy , these excited electrons are shifted up from their low-energy levels to the higher ones . The kinetic light energy is stored as a potential chemical energy in the chlorophyll , so , the chlorophyll molecules are said to be in an excited state or activated state . When the stored potential chemical energy is released , the electrons fall once again to the lower energy levels and the chlorophyll will return to the stable state , ready for another influence of light to become excited once more . Part of the energy released from the chlorophyll is used in splitting up the water molecule into hydrogen and oxygen , where : hydrogen combines with a co-enzyme present in the chloroplast ( NADP ) to give NADPH2 , in this way hydrogen will not escape or recombine with oxygen again , Oxygen is released as a secondary product . The other part of energy from the excited chlorophyll is stored in ATP molecule ( energy currency in the cell ) by the combination of ADP molecule ( which is present in chloroplast ) with a phosphate group ( P ) by means of a high-energy bond marked by a squiggle ( ∼ ) , this process is called photosynthetic phosphorylation . ADP : Adenosine DiPhosphate . ATP : Adenosine TriPhosphate that carries the energy to the dark reactions . NADP : Nicotinamide Adenine Dinucleotide Phosphate which acts as a hydrogen receptor . Dark reactions ( Enzymatic reactions ) is a group of reactions that occurs in the stroma of chloroplast in which the temperature is the limiting factor for the rate of photosynthesis , so , these reactions can occur in both the light and darkness . In these reactions , hydrogen carried on NADPH2 is used to fix CO2 gas by reducing it into carbohydrates with the help of energy stored in ATP molecules . Malvin Calvin and his associates at California university revealed in 1949 , the nature of dark reactions by using the newly discovered radioactive isotope of carbon 14C . They placed the Chlorella alga in the apparatus . They supplied the alga with CO2 gas that is containing the radioactive carbon 14C . The apparatus was exposed to a very brief light of lamp to allow the photosynthesis process to take place . Chlorella was then immersed in a beaker containing hot alcohol to kill the protoplasm by stopping its biochemical reactions . They manged to separate the products of photosynthesis by special means and tested for the radioactive carbon in these compounds . The first stable compound produced from photosynthesis . Used in building glucose , starch , proteins and fats . Used in the cellular respiration as a high-energy compound . Calvin also pointed out that the synthesis of hexose sugar ( glucose ) is not completed in one step , but through out several intermediate reactions catalyzed by certain specific enzymes .